4 How to Download ALP Tech Exam 2019 Admit Card or e-call Letter ? 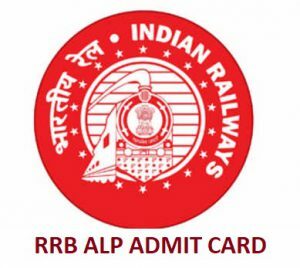 RRB ALP Exam Admit Card 2019 Download link: All the eligible candidates who are successfully qualified & Eligible for the stage 1 RRB CBT CEN 01/2018 Exam and waiting to Download Admit Card for ALP Exam that will going to be conduct to fill 60000+ Vacant (Vacancy increase from 23000+ to 60000+) Posts in Railway Department under 21 RRB Regions. Here, Indian railway department finally activated the downloadable link for admit card or Call letter for the recruitment of ALP & Technician grade-3 (Group C Posts) through CBT Exam for 31-August-2018 Exam| Admit card Available now. All the applicant must firstly, check the RRB Notification. If you applied online for any alp Posts then, you are eligible to download admit card where you will get details of Exam Center and City, SC/ST Travel Pass and to get appear in Computer Based Test exam. This page is specially create for knowing the railway Loco pilot exam admit card or Call letter detail. In this posts you will get direct link to Download regions wise Admit Card and Step by Step procedure to check results & Admit card from the rrb’s 21 Regions Official websites and 16 RRC Official Websites. Railway Recruitment Board is responsible for conducting Exam for hiring eligible candidates. There are total 21 RRB’s Board’s that is situated in different location overall in India i.e Thiruvananthapuram, siliguri, secunderabad, ranchi, patna, muzaffarpur, guwahati, gorakhpur, chennai, chandigarh, bilaspur, bhubneswar, bhopal, bangalore, allahabad, ajmer, ahmedabad, mumbai, malda, kolkata, jammu-srinagar. Below you will get step by step procedure to download Admit card for railway exam 2019. As, millions of Candidates applied for Examination (CBT) of ALP, Tech. Group C 60000+ posts. Candidates can also check below Exam syllabus, Exam pattern and best books then, start doing to preparation. How to Download ALP Tech Exam 2019 Admit Card or e-call Letter ? All the applicant can download the admit card from the official websites of rrb region for which they had Applied. Below you will get all 21RRB name with official website Name. After knowing the official website you can follow below step to download Admit Card-E-call letter. As, this is a page for knowing all latest exam e-call letter, Admit card, result or alp tech related detail. If railway will conduct any exam in future. This page will be updates on regular basis whenever any news will release by railway recruitment board in their official website. If you have any query please feel free to ask. Our team will response soon and help you as Much as they can. Don’t forget to share this useful information with your friends.